Sesshomaru is in a good state with his empire proudly serving under him. When they are not fighting battles on his behalf they are working on the huge castle that is to belong to Lord Sesshomaru, Dog Demon Ruler of the West. Sesshomaru has time now to focus on his empire or any other situations that pertain to his personal life because those wanting to battle him are not able to do so that easily, They must go through his empire of demons first in order to fight him. Lord Sesshomaru's only problem is Zeref. Lord Sesshomaru often visits his full demon son Heroshya who is only 9 years old, however the aging process for dog demons is twice as fast than it is for humans. Young, demons will look of a mature age quickly. A young demon will look and act about 4 years older than what they really are, however the aging process slows down to extreme levels when they reach their prime age. A 100 year old Demon has the ability to retain a young looking humanoid form of a 25 year old on the outside, while at the same time maturing in wisdom and age on the inside and they can live for hundreds of years if they are not killed by force, Of course they are also able to transform in to their true form at will. Heroshya is 9 years old but appears to look 13 and he is intelligent just as his father Sesshomaru. 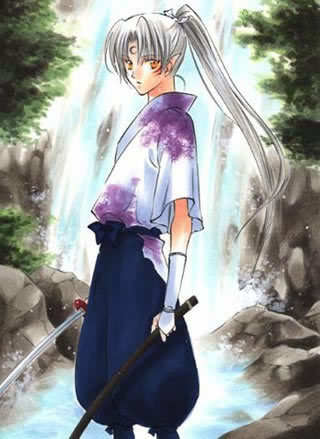 Heroshya wears his long silver hair into a ponytail, he is thin and wears blue pants with a white and purple shirt, with white fighting gloves. He has the demon stripes and the dog demon crescent on his face and forehead as such a full blooded dog demon would. Sesshomaru is proud of his son and visits him often to teach him the skills and fighting techniques that he will need to have. Heroshya is aware that when he comes of age, his father will create a sword for him originating from his powerful fang just as his grandfather had done for his sons..for now, Heroshya practices fighting with a light weight sword and uses his demon powers daily to master them. Herosha has spent his short 9 year life only around other demons and does not associate himself with humans, he feels that humans are inferior to him and other demons so he does not bother to waste his time near them however, he feels no hatred toward them, he just feels that they are useless, helpless creatures. Heroshya's personality is not like his father's. When around other demons he smiles and has a playful sense of humor; He likes to spar and fight all the time which comes naturally to him. Heroshya at this time tends to favor his mother more than his father. Feeling a sense of empathy for his mother whom Sesshomaru no longer had use for once his son was born, Heroshya tends to feel a slight animosity toward his father for this reason. Lord Sesshomaru explained to his son that his mother was sought out for the purposes of baring him a son to carry on his legacy. Sesshomaru does care for Heroshya's mother but the arrangement was strictly for that reason and that reason alone, for Sesshomaru is not one to fall in love or have his heart subject to vulnerability so easily and he tells his son that he should be cautious of allowing women to enter his heart. Heroshya is still confused by his father's words because his actions do not coincide, He thinks to himself: My father forgets that he has told me of the human girl that he frequently visits, the girl who has been his companion since she was little. He has protected her and cared for her, Is he telling me he does not carry her in his heart, He will have me believe he does not love her? When Heroshya tries to bring this fact to his fathers attention, Sesshomaru only responds by exclaiming, "That is an extraordinary situation that I am unable to clarify for you, for now.... I am simply advising you not to let your heart be taken by a woman, too often or too easily." Heroshya knows that his father is very wise and takes heed to all advice given however female demons are the very last thing on Heroshya's agenda, he requires to spend every minute learning to fight and become one of the most feared of demons as his father. Meanwhile, Zeref is waiting for his demon servants to return to him with news of Sesshomaru. They furnish Zeref with every detail of their fight with Sesshomaru, they inform that his brother Inuyasha assisted in the battle as well as a whole panther demon tribe but most strange of all, a human girl bought down one of Zeref's most reliable demon servant, Fakotze (the large flying snake that Rin attacked). Zeref sounding intrigued by this bit of information, "Human girl...hmmm" The demon servants respond "Yes master, she has some connection to Sesshomaru. We observed them talking to each other as we were approaching to attack the village." Zeref sits and thinks quietly for just a few moments while twisted, calculating ideas intertwine his thoughts. He speaks to his servants, " I want Sesshomaru watched. I want to know of anyone who has a close connection to him, Starting with his Son Heroshya.....Find out who this human girl is as well." His servants respond, "Yes Master we will return to you with this information." 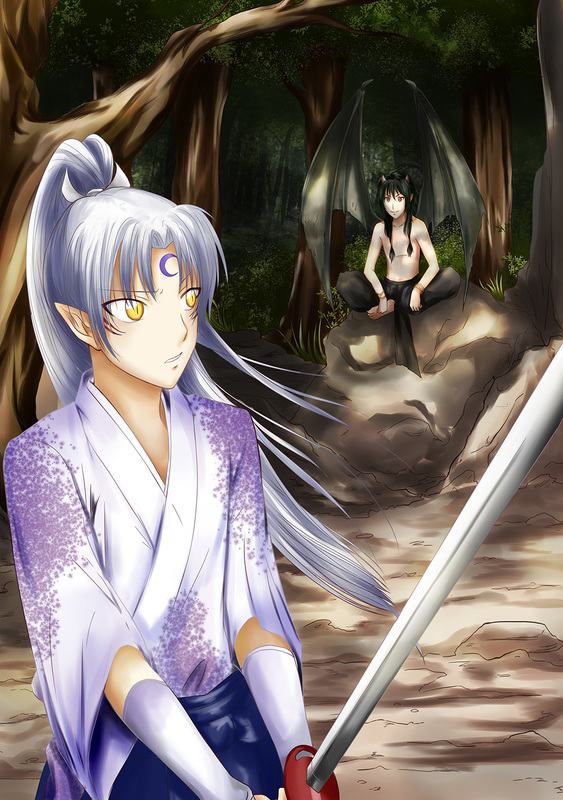 After his father's visit with him, Heroshya decides to practice sword wielding alone in the forest...as he is practicing he looks up and notices a demon boy about his age sitting on a big stone near by watching Him. Herosya thinks: Hmmm, where did he come from? He looks like he may be from the bat tribe. Herosya continues to practice while he speaks to the demon boy, "Don't you know it's rude to stare?" The boy responds, " My apologies, I was just admiring your sword strokes, they're not bad...where did you learn such techniques?" Heroshya responds while continuing to practice, "I suppose my father has taught me well, we practice together often, I also practice with friends." The demon boy begins to introduce himself, "excuse me for watching, my name is Ryo; I'm from the gargoyle demon tribe. Would you mind if I practice with you? maybe you can teach me some of your tricks and I will teach you mine?" Ryo is a full demon from the gargoyle demon tribe and is the exact same age as Heroshya. He has black hair as dark as night and brown eyes, he also has very black wings that contract in or expand out wide if he wants them to. Ryo and Herosya practice sword wielding, showing off demon powers they possess and talking. Heroshya tells Ryo that his father is none other than the Great Lord Sesshomaru, Demon ruler of the West. Ryo seems to be astonished by this information and begins to ask more and more questions about Lord Sesshomaru but Heroshya being a cordial demon is also intelligent and cautious. Knowing that his father does have many enemies, he does not provide too much information to this stranger that has befriended him. Ryo asks Heroshya if they can practice together again in this same place tomorrow and Heroshya agrees. Ryo flies off from the area and meets with the other Gargoyles of his area in the East. He begins to walk straight up to the empire castle of Lord Zeref. He walks up a long and wide stair leading to where Lord Zeref is sitting at a huge throne and kneels to him bowing his head. Zeref asks "What information were you able to get for me Ryo?" Ryo responds, "My Lord, I was unable to get any significant information from the son of Sesshomaru. Curse him, He was careful to hold his tongue. Not to worry master, I will gain his trust and I will retrieve any and all information that you desire." Zeref replies, "Be sure that you do Ryo, I am relying on you to bring me information I can use to bring the dog demon down. You are young but you have more intelligence than many of these demons that serve under me....Don't fail me." Ryo responds, "Yes master, I will not fail you. I just need a little more time." Ryo and Heroshya spend many days by the woods sparing with each other, practicing fighting techniques, sharing tips and life stories with each other. Ryo has also given Heroshya an untrue sob story about a hard childhood growing up without his father to gain Heroshya's trust and sympathy but Ryo is still unable to get Herosya to open up to him. He is careful not to supply Ryo with any private information about his father's empire, Rin or his father's whereabouts. Ryo grows frustrated by this and is unsure how to make Heroshya talk, so he visits a human woman that he has heard of who is very skilled in spells and magic whom can see inside the mind and thoughts of someone. The woman says she has the perfect solution to his problem and for a small cost, she can help him. Ryo informs that the only reward she will get for helping him is that she will not be torn to pieces by his tribe of gargoyle demons. The woman scoffs and replies, "If you tear me to pieces how will your problem be solved...do you think that it is wise to kill me? My price is small and simple, pay it and I will supply you with what you need." Ryo indulges her, "What is your price old woman?" she explains, "my daughter is dying, I will need to transfer her soul out of her current body and into another. I am cursed and unable to leave this place." Ryo asks her, "What do you mean?". The old woman tries to leave the hut she is in and a huge fire bars her way. She continues her story, " This bar of fire is a curse that was placed on me by a witch demon that used to be my partner in conjuring spells and incantations, we had a huge quarrel one day and she did this to me; now I am unable to leave this hut, I must remain here until the day I die. You must find a suitable human body so that I may transfer my daughter's soul to it and she can live on, then I will give you what you need. " Ryo agrees to her price. Once Ryo has returned a human sacrifice as payment to the old woman for her services, she provides Ryo with a small seashell necklace. He looks at the necklace with the small seashell on it and then back at the old woman with a dissatisfied look on his face. The woman explains, "This is what you need. You say you practice fighting in the woods with this young demon, you will need to make one of those practice fights reality. Get him on the ground, once he is unconscious put the seashell to his forehead and you will consume all his secrets or any information he is trying to keep secret, then you will be able to place your ear to the seashell opening and it will tell all, you will hear all of his secrets. I assure you it will work, of course if it doesn't....you know where to find me." Ryo flashes a sinister smile and leaves with the small seashell around his neck. The next day Ryo goes to see Heroshya again, he is anxious to spar with Heroshya so that he can get all the information and secrets about Sesshomaru that his master needs. Ryo says to Heroshya, "Well, let's practice." They begin to spar and Ryo starts off as if he is just practicing; thinking to himself: I have to time this accurately, I will wait until just the right moment. Ryo sees his chance when Heroshya glances at a noise that came from the trees, Ryo gets into position to strike a vicious blow and Swiftly Strikes down at Heroshya but he is too slow, Heroshya automatically sensed the difference in Ryo's stance and position and knew that this was a blow to intentionally harm him, Heroshya blocks Ryo's strike with one hand and upper cuts him with tremendous power with his other fist. Ryo hits the ground fast and hard, he has a shocked look thinking: I was too slow in striking Him, now my plan won't work. Ryo determined to get what he came for thinks of a new plan fast, He jumps up and flies above Heroshya's head and strikes him with massive amounts of stones which is one of Ryo's demonic powers. This time his plan works as he tries to immobilize Heroshya in a tomb of stones. He continues to shoot stones out until Herosya is covered up to his neck, he then quickly flies down to place the shell on Heroshya's forehead to get what information he can. Heroshya is encased in the numerous stones and thinks: What is he doing with that sea shell? Heroshya has to use his demonic powers to get out of this stone wall Ryo has trapped him in, he transforms into his dog demon form and uses the enormous strength he has in that form to burst from the stone prison but by this time Ryo has retrieved a good amount of information into the seashell and begins to fly off. Determined to get that seashell and destroy it, Heroshya flies after Ryo. They fly at top speed, Ryo trying to get away while Heroshya is on his tail. Heroshya uses one of his demonic powers while still in dog form, shooting laser red hot darts from his eyes that are powerful enough to burn steel and one hits Ryo in the shoulder. Ryo yelps loudly in pain and the blood begins to seep out fast. Ryo decides that there is no time to waste,he had better listen to what he has in the seashell now before Heroshya gets it from him, It's only a matter of time before Heroshya catches up with him. They continue to chase each other in the air as Ryo holds the seashell to his ear and can hear Heroshya's thoughts: How can my great demon father be in love with Rin, a mere weak human woman. How could he abandon my beautiful mother for her affections, I don't know if I can ever forgive him for that. Before he can hear anymore Ryo feels another sharp sting across his back, Heroshya has gotten close enough to Ryo to give one mighty swipe across his back with his extremely sharp acid claws, the intense pain causes Ryo to scream and drop the sea shell that was in his hand at that moment. 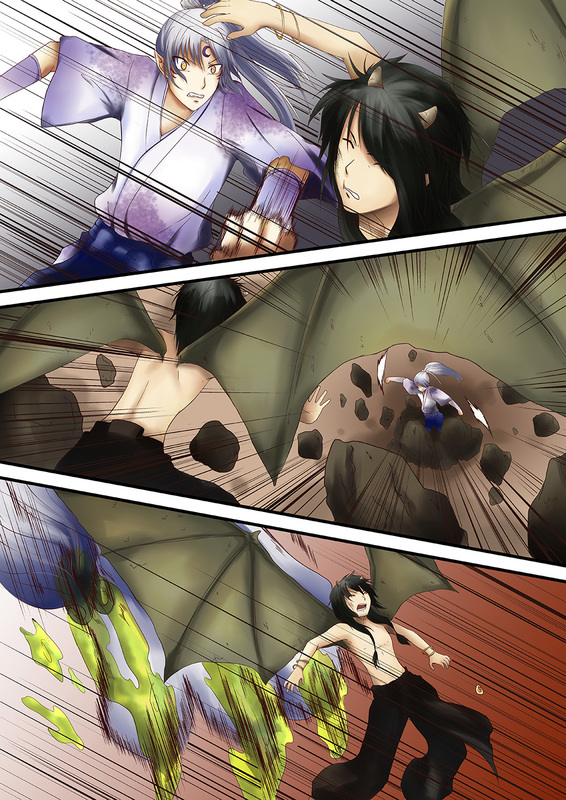 Ryo will risk his very life for that seashell containing the information that his master needs and attempts to fly down to it but Heroshya uses his mighty dog demon jaws with lightning speed to bite one of Ryo's Wings and fling him aside with much force, then proceeds to fly down to the shell himself. He gets to the shell before Ryo and crushes it with his strong paw. Ryo hoovering in the air with his dark wings spread wide and flapping, looks down at the shell being destroyed and feels great anger at having to go back to his master with no information, he angrily yells with frustration as he uses his demonic power on Heroshya once again but instead of many stones he creates one huge stone in the shape of a sharp spike and thrusts it swiftly and forcefully at Heroshya aiming to pierce his body with it but Heroshya easily avoids the impact. Heroshya turns back into human form and shouts, "I've destroyed that seashell of yours Ryo, If I have to come after you again, This time I will kill you!!!" Ryo scoffs at Heroshya's comment with doubtfulness but still flees due to fatigue and pain of his clawed back. Heroshya watches Ryo fly away and thinks: He was listening to something in that seashell right before I clawed him, what was it? He looks down and picks up a few shards of the broken sea shell wondering: What power did this object possess. What was Ryo trying to accomplish?